A little old and a little new – take a trip to Old Fourth Ward for endless opportunities. Located on Atlanta’s Eastside, this neighborhood is home to the childhood residence of Martin Luther King Jr. and a few of the city’s latest and greatest developments. Breakfast: Start your morning with a Southern breakfast at Highland Bakery. Enjoy the signature fried chicken eggs benedict or for those with a sweet tooth, try the peanut butter stuffed French toast topped with caramelized bananas. Morning: Brush up on the history of Dr. King as you enjoy a self-guided tour of the Martin Luther King Jr. National Historic Site. Visit the civil rights leader’s birth home, historic Ebenezer Baptist Church and the Martin Luther King Jr. Center for Nonviolent Change, featuring exhibits and artifacts as well as King’s final resting place. Afternoon: Run, walk, cycle and capture photos of the colorful murals along Atlanta BeltLine’s most popular stretch – the Eastside Trail. The trail stretches from Old Fourth Ward to Piedmont Park, and the walk from Krog Street Market down this 3-mile path to showcases an abundance of art and great views of the city. 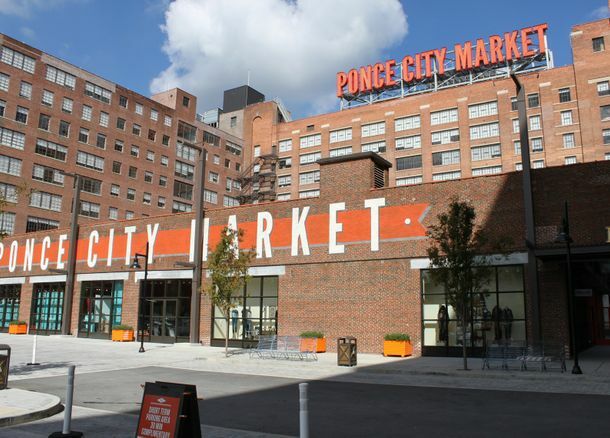 Stop by Ponce City Market, the former Sears, Roebuck & Co. building, for a variety of lunch options. Try H&F Burger for Linton Hopkins’ famous double cheeseburger, Minero for some Southern-Mexican tacos or Farm to Ladle for a healthier option including sandwiches, salads and soups. After lunch, relax in Historic Old Fourth Ward Park – home to a pond, amphitheater, playground and a 15,000-square-foot skate park. Dinner: Dine at Staplehouse, nominated for the James Beard Award for best new restaurant in 2016. Try the tasting menu for a five-course meal that changes daily. Staplehouse also offers an a la carte menu that rotates regularly based on season and products. Late Night: Have some fun on Edgewood Avenue, the strip that gives Old Fourth Ward an active nightlife. Dance the night away at The Sound Table or enjoy a drink with locals at Edgewood Speakeasy, located behind a secret bookshelf door in Bone Lick BBQ. End the night on Jackson Street Bridge to take a classic Atlanta skyline photo overlooking Freedom Parkway. Visit Atlanta.net/explore/neighborhoods/eastside/old-fourth-ward to learn more about Old Fourth Ward and Atlanta’s other diverse neighborhoods.